Union Gospel Mission food programs feed hungry and homeless neighbors and provide meals for low-income men, women, and kids. At Union Gospel Mission Twin Cities, we feel called to feed the hungry (Isaiah 58:7) and fulfill the mission of compassion Jesus requires of us (Matthew 25:35). 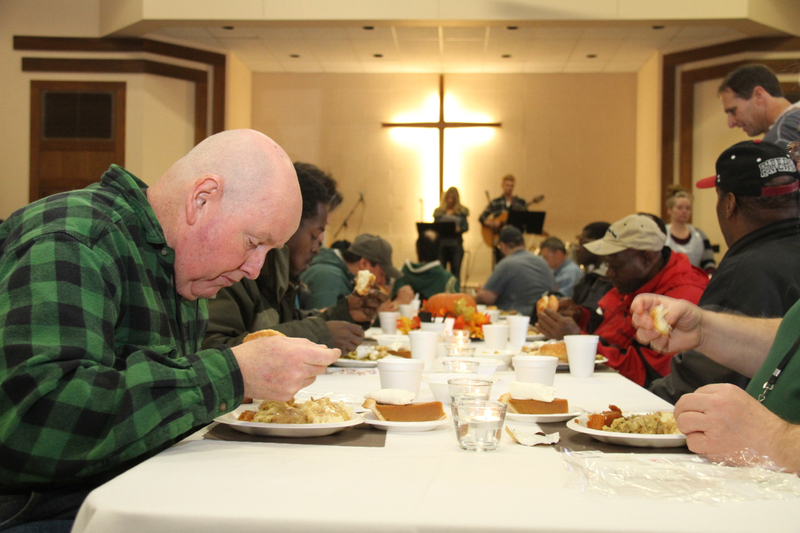 A meal at the Mission is often the first step toward a new life. Our guests come in and learn about our life-changing programs. Some people take us up on it–and get a fresh start. But we feed anyone who comes–no questions asked or expectations given. Because that’s what God has called us to do: offer hospitality to everyone and treat them with dignity. Sometimes a person’s hunger is just a symptom of a deeper need that we can help meet. Opening the door at the Mission for a meal might just be the first step toward finding God’s greater plan for their lives. See how your partnership with UGM Twin Cities feeds hungry people and changes their lives. The Mission runs 2 kitchens, using paid and volunteer staff and residents who work every day of the year to prepare thousands of meals for hungry and homeless men, women, and children in our community. Approximately 16,000 hot meals and bagged lunches are prepared and served each month at our Men’s Campus. 1,800 meals are prepared and served monthly to women and children at our Naomi Family Residence. Over 2,000 meals are hand-delivered to St. Paul senior high-rises for Thanksgiving and Christmas. More than 1,700 holiday meals are served to the public on Easter, Thanksgiving, and Christmas. On average, 900 meals and snacks are prepared each month for our Child Care Center. Over 56,000 complete take-home Thanksgiving meals are given to families in need. Our Ticket of Hope provides a nutritious meal at the Mission. Print one to keep in your car or purse and the next time you meet a homeless person face-to-face give them a ticket to the best help anyone could ever offer. "The Mission brought God back into my life with spaghetti and meatballs and a salad." "I was starving. And I came down here and it was a fest. A taco fiesta. I’ll never forget it." "You never forget that first meal — you know your life is going to change."